Ted Wilkinson was not available for the regular car test this month and editor-in-chief Malcolm Ginsberg has returned to a previous life in producing this review. He is also a Luton Town fan and you can skip the first three paragraphs if you are not a football fan or do not have the slightest interest in the Hatters. The club shirt sponsor for at least the next two seasons is Korean car manufacturer SsangYong. As its most famous supporter might have said, “not a lot of people know that”. Here, Ginsberg gives something of an introduction to SsangYong and its top-selling Tivoli. We also highlight the Shelby Mustang – if you are going on holiday this summer to the US, you might want to try the Hertz ‘Adrenalin’ Collection. For England, their finest hour was 1966. With Luton Town it was 1988, when the Hatters beat Arsenal in one of the best League Cup finals of all time. And rather like England, it’s been all downhill, more or less, since. For the following season the club was banned from the European place it had won (due to wrongdoings by others – Heysel) and in 1992 it was the final team to be relegated from the old First Division (not David Pleat’s finest hour, losing to the already-relegated Notts County in the last match of the season). The 2009-2010 season saw the club playing in the Football Conference after a deduction of 40 points for financial irregularities by past directors, and a transfer ban. To add to the pain, the FA allowed a Franchise team to be created nearby in spite of representations by Luton and other local clubs and promises it would not happen. No club had moved so far since Woolwich Arsenal in 1913. Luton is the only club to have won the Football League Trophy and been unable to defend it (not being in the League any longer) and also the only non-league club to have beaten a Premier League team in the FA Cup with a victory against Norwich City at Carrow Road in 2013. Under the then-manager John Still, Luton Town won the Conference in 2013-2014 with a record points total. Now things are looking up, with a new stadium planned on derelict land near the main Luton railway station. Called Power Court, it is supported by the local council. The team, with eight summer acquisitions and a new purpose-built training facility, is raring to go at the start of the new season. High hopes. 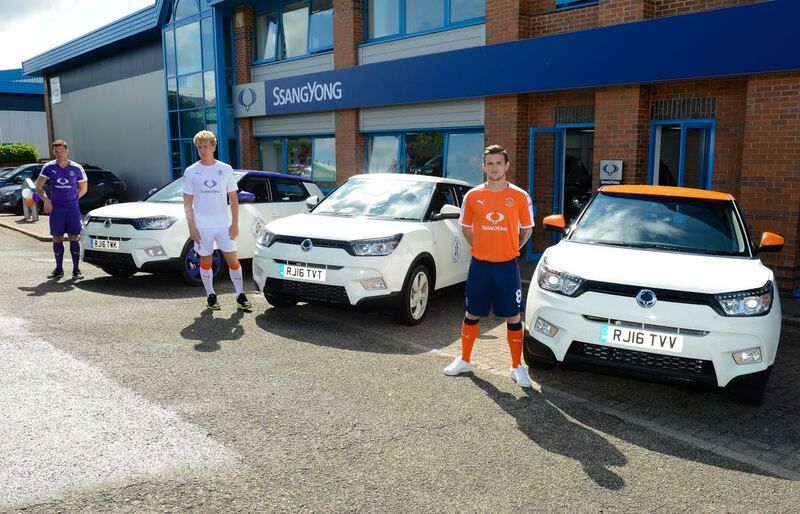 Which brings us back to motoring and the team's new shirt sponsor SsangYong, with UK headquarters on the Luton Airport estate. Established in 1954, it is Korea's oldest vehicle manufacturer and the country’s only 4x4 and SUV specialist producer. It is 73% owned by the Indian engineering conglomerate Mahindra & Mahindra. There are currently some 60 SsangYong dealers covering England, Scotland, Wales and Northern Ireland. The current SsangYong range consists of the 4x4 Korando (a 2.2 ltr muscle car popular with caravan towing types), Rexton (a serious luxury off-the-road quality product) and the Tourismo (seven-seat people carrier). Add to that the 1.6 ltr Tivoli in a number of variants, easily the biggest seller in the UK market with a 50/50 split of diesel and petrol sales. As behoves what is South Korea’s answer to Land Rover, an all-wheel-drive version was recently introduced and is now pushing towards 10% of sales. 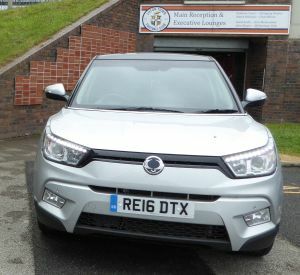 BTN editor-in-chief Malcolm Ginsberg managed to grab a top-of-range front-wheel-drive Tivoli ELX diesel automatic with a list price of £18,250. The petrol version comes in at £17,000. As they say, ‘first impressions count’ and here you have a keyless car (keep it in your pocket) which says ‘welcome’ when you push the starter button. It also says ‘goodbye’ as you switch off and if you push a neatly-recessed button on the door handle, the wing mirrors swing in and the car doors lock. This is a neat safety measure, as closing the wing mirrors when inside the car makes for a dangerous exit as you can’t see cars coming past. At night there is a red light in the door, a safety measure usually found only on more expensive cars. You sit high up in this crossover car, which competes with the Nissan Juke and Renault Captur. It feels, and is, a quality product and very competitively priced. The Tivoli has heated leather seats (ideal for going to soccer matches in the winter), dual climate control with memory, and an impressive touch-screen for, among other things, the radio, Tomtom navigating system and rear reversing camera. 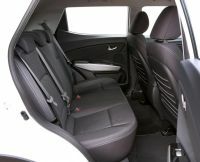 There is plenty of storage space for all sorts of items, and passengers in the back will find the space generous. From a driving point of view, the handling was excellent and the cruise control very easy to use. The smooth six-speed auto box comes from the same source as the MINI. A nice touch was a ‘mute’ button on a control stick, part of the audio controls, so you can switch off the radio quickly when your passengers have something to say. There is a tyre-pressure screen to view and mood lighting on the door trim and central fascia. The boot is large and deep and the car has split rear cushions, making carrying a long load possible. There is a USB memory slot, Aux port and HDMI port and the car goes from 0-60 in just under 12sec with a top speed of 107mph according to the manufacturer. The fuel gauge showed 46mpg. There was privacy glass for the rear seats and tailgate (good for a private getaway after a bad match result), and there are heater ducts into the rear seats. SsangYong is on the way up. We hope too for Luton Town, and a 3-0 thrashing of Plymouth Argyle away last Saturday was as good a start to the new season as you could wish for. British travellers visiting the US this summer can now make their road trips a little bit more exciting with the return of Hertz's 'Rent-a-Racer' programme, which offers drivers the chance to get behind the wheel of the brand-new Hertz Shelby GT-H Mustang. Part of the Adrenalin collection, the Mustang is available now at 17 locations across the US as Hertz celebrates its 50th year in partnership with Ford and the legendary performance manufacturer. Hertz first introduced a custom Shelby Mustang as part of its “Rent-A-Racer” program in 1966, when Hertz and Carroll Shelby saw an opportunity to give everyday drivers and car enthusiasts a special experience – the chance to get behind the wheel of a high-performance vehicle. That year, the 1966 Shelby GT350-H, now a favourite of car collectors, was introduced. Ford supplied the Mustangs with V8 engines and mostly automatic transmissions, Shelby added extra performance and style and Hertz gave customers access to a unique driving experience. 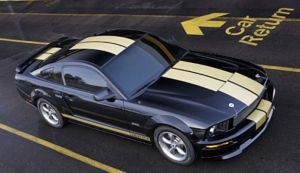 As a tribute to the original Rent-A-Racer, the companies teamed up in 2006 to produce the 40th-anniversary edition Shelby GT-H. Today, these models are among the most sought-after collector cars in the world. “We want to give Hertz customers a special experience this summer,” said Matt Jauchius, executive vice president and chief marketing officer at Hertz Global Holdings. “To mark the 50th anniversary of the Rent-A-Racer, we’ve joined forces with Ford and Shelby once again to introduce the 2016 Ford Shelby GT-H. We’re thrilled to make this iconic vehicle available to our customers through the Hertz Adrenaline Collection. “It’s truly the perfect ride for anyone who wants to take their summer road trips to another level,” Jauchius added.